Response it fast. Kind and helpful. Everything went smooth sales person made us feel comfortable and worked hard to make sure we were comfortable with the deal we got. has the best customer service skills that I’ve ever experienced and I’ve got 10 years training in the customer service industry. He is passionate, yet relentless, to provide above extraordinary customer service. I believe every customer that comes in contact with Joshua will leave 100% satisfied, comfortable, and excited about their purchase. He isn’t selling vehicles, he sells happy satisfaction to customers. Derek has been helpful & patient in understanding what we are looking for. First time to North Bakersfield Toyota and my whole families experience was great. Patrick was a great sales person and the finance people were great! Everything was smooth sailing! Me and my family sure had a great experience here! Welcome to North Bakersfield Toyota’s website. Here you’ll find all the information you need to make an informed purchase of a new or used car at our Bakersfield, California Toyota dealership. If you’re looking for a Toyota Dealer that welcomes customers from the Delano, Visalia or Hanford areas, stop by North Bakersfield Toyota in Bakersfield, where we will exceed expectations with a truly exceptional experience whether you are purchasing that new Toyota or having your vehicle maintenance performed by one of our factory trained certified mechanics at our Bakersfield Toyota Service Center. Give us a call at (661) 218-1678. 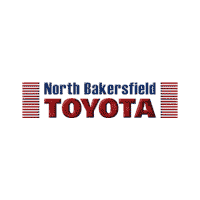 At North Bakersfield Toyota we strive to maintain a comprehensive selection of new Toyota models in Bakersfield, CA. Select from all of the latest Toyota models including the Toyota Camry, 4Runner, Highlander, Tacoma, Tundra and more. We are the Bakersfield Toyota Dealership in proudly serving customers in Kern County, Porterville, Visalia, and Hanford areas. If interested, feel free to stop in and test drive some of the best selling vehicles in America. Looking for a car loan or lease? Come speak to the experts at our Toyota lot and showroom. Our dealership can create customized loan and lease programs tailored to your needs and perfectly suited to your lifestyle. In order to accommodate your needs, the terms of our financial programs can be extended to lower monthly payments or you can pay a little more to shorten the duration of your loan. If you need auto financing, don’t hesitate to give us a ring or drop in to speak with one of our financial representatives. At our location, you’ll find Toyota parts & accessories as well as professional auto repair or service. If you need any kind of vehicle maintenance, repairs or specialty parts we serve the Porterville area and the Bakersfield region, visit our dealership for professional service. We’re conveniently located at 19651 Industry Parkway Drive. Check out our about us page. Then give us a call at (661) 218-1678, or follow these directions from wherever you are to 19651 Industry Parkway Drive, Bakersfield, CA 93308 today. We look forward to serving all of your automotive needs.